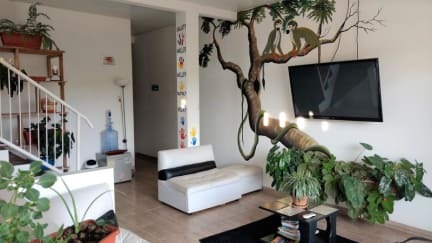 Pirañita Hostel is a comfortable and clean accommodation with air conditioning, very friendly local staff with huge knowledge about the amazon region, and happy to share amazing moments with you. 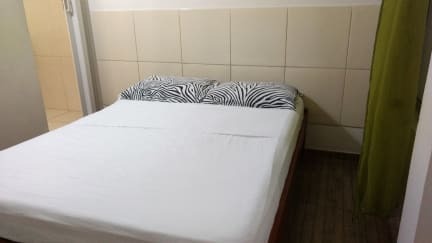 We have two dorms and three private rooms, all of them with private bathroom and shower, linen is included. We have a big kitchen with everything you will need for cooking, fridge and a nice view of the city from the third floor. Laundry service at an affordable price. Our breakfast is included and we speak English, Spanish, French and Portuguese. We are located in the main street of Leticia, and really close you can find the best places to eat (cheap or gourmet) and drink, as well as, cafes, doughnut shop, handcrafts shops, ice cream shop, asai shop, and so on. Just 5 blocks from the harbor and 5 blocks from the Brazilian border, make it easy to move around the town. We have two double private rooms, one twin room, one dorm for four people and one dorm for seven people. All our rooms have air conditioning, and bathroom and shower ensuite. We povide towels in the private rooms and in the dorms people would need to rent a towel. We also offer a cool jungle tours! 5.4.3.2 days in jungle. you can see the difference between high jungle and flooded jungle, with too many activities! we help you to plan the best experience here in the amazon! Also if you book 3 nights tour with us, you get 3 free nights in our hostel after!! contact us!